“Update me, Kevin”, I said to Linnane on the phone. I was talking about my specimen fish scoreline, which, I knew, stopped short, datewise, when I went to live in the U.S.A, back in 1975. I was confident, though, that I had nine and that I needed just one more specimen to bring me up to the coveted total of 10. A few days later, my list of big fish captures came in the post. “No error”, he said. “A actually your score is six. Becuase you are doubled up on coalfish. You caught two coalies at Belmullet. I was with you at the time, if you recall”. “Yes I remember”, I said. “It was the time we were jigging 8 ounce pirks through thirty fathoms and the big coalies could bit anywhere from the bottom to within a few feet of the surface, so it was the most physically demanding sea fishing I’ve ever done. Sort of saltwater, er, coal mining. Get it”. Yes I remembered – and Kevin’s list brought back other memories also. Not always, though. There’s a red bream from Kinsale listed I can’t distinguish from the mass of the scarlet-and-silver little rascals we used to catch so many of, back in the super Sixties. 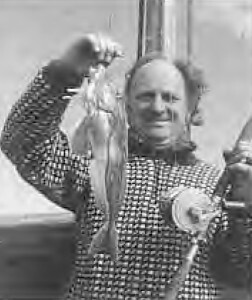 But yes, absolutely, I do recall well a 129 lbs skate I caught off Ballycotton in 1961. The size itself was unremarkable, I suppose, it’s the memory of the actual day at sea that stays with me. That was because, for me, it meant revisiting history. Ballycotton was where serious, heavy duty sea angling started, and I’d walked into Fawcett’s Hotel there almost reverentially. Later I’d meet the O’Sullivan brothers, by then in their 80’s, who recalled for me how they’d get up at 5. a.m. every fishing morning to walk to Saleen to collect mussels for bait – at that time, feathering for mackerel was unknown. Which, of course, is just what we did. But I wasn’t always sea fishing, and back in 1969, fired by the tales I’d heard of the big brownies of Lough Mask, I went there with the intention of trolling the lake until I caught one. Which I did. But it was hard work. In the B & B every evening, other anglers would come in with the nice basket of “ordinary” brown trout they’d caught on the wet fly, while I’d have nothing to show. And then, early in the morning of my last day, the big fella hit …. and proved just over specimen weight at 10 lbs. 4 ozs. On the list Kevin sent to me also was the only Irish record fish I ever caught – a 10 lbs 8 oz. tub gurnard that took my bait off Erris Head in Co. Mayo, which I thought was a cod all the time I was fighting it until its beautiful, brilliant, blue pectoral fins spread out butterfly style broke surface. All the same, though, in spite of the memories, I’m still well short of that 10 plus mark, species-wise.